Lord Alarnath temple in Brahmagiri, around 25 km from Puri, is not a big tourist destination but a famous religious place for all Krishna devotees. It is explained that in Satya Yuga, Lord Brahma came and worshiped Lord Vishnu here on top of a hill. One day Lord Vishnu appeared and said, “I am very pleased with your worship. Make a four-armed Deity of Me holding shankha, chakra, gada, and padma (conch shell, disk, club, and lotus). The Deity should be made from a piece of black stone. Also install a Deity of Garuda”. Lord Vishnu also said, “This place will be called Brahmagiri (Brahma’s hill) because you have worshiped me here”. According to mythology, the rulers of Alwar in Rajasthan had established the temple here. The temple was later known as Alwarnath or Alarnath. Long yesrs back (in 1610 A.D) Lord Chaitanya Mahaprabhu stayed at Alarnath during anavasara period of Lord Jagannath. Anavasara is the two weeks period when Lord Jagannatha take rest in isolation from the rest of the world after suffering from fever due to the annual bathing festival (Snana Yatra). Lord Chaitanya claimed that he visualised the appearance of Lord Jagannath in Alarnath and spent a long period in worshipping the deity here. It is believed that those who can not worship Lord Jagannath during his stay in the sick chamber can get the blessings of the deity if they visit the Alarnath temple. During this period the temple servitors offered holy rice porridge, known as ‘Kheer’ in local language, to the lord. During anavasara period of every year thousands of devotees visit Alarnath temple to get the blessings of Lord Alarnath and to taste a pot of famous holy ‘Kheer’. 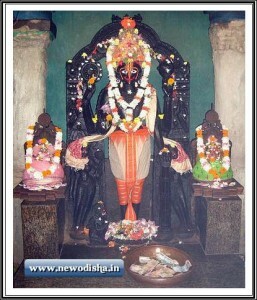 In this temple Lord Vishnu is worshiped as Lord Alarnath. The deity has four arms. He holds chakra in his upper right hand, Lotus in his lower right hand, Conch in his upper left hand and club in his lower left hand. Lord Vishnu’s carrier eagle, known as Garuda, kneels at the feet of the deity with his hands folded in prayer position. The deities of Lord Krishna’s queens Rukmini and Satyabhama are also find inside the temple. Deity of Lord Chaitanya is also found inside the temple. There is a stone slab in front of the deity which bears impressions from Lord Chaitanya’s body. When Lord Chaitanya first lay in full respect in front of Lord Alarnath, the stone below Lord Chaitanya melted from His blissful touch. There is a lake behind the temple where Chandan Yatra (Sandalwood Fbuyeestival) is celebrated for 21 days every year. Give Responses for "Lord Alarnath Temple, Puri"